I wish I were in better shape. Those stairs at school are gonna be brutal. I know it will be okay to go – only half-time, a nice change of scene, E in very good hands… I’m just in denial about the fact that I suddenly have someplace I must go in spite of my whole life’s priorities having shifted since last the last time I was there… it’s hard to express. I’ve just been used to putting E’s needs before basically anything else, and feeling good to do so – and suddenly I have to care about things like being dressed nicely? It’s culture shock. At this time last year, I was hugely pregnant, and had just been to a friend’s wedding I didn’t think I’d make it to (turned out I had plenty of time), and was finally getting around to making real progress on the baby’s room. Today, I received an amazing story for MotherGather, one that makes me all the more grateful for my life. E is adorable as usual, even though I’m trying to help him learn to sleep without the swaddle and he took over an hour to get to sleep for his afternoon nap… argh. I have loved mat leave. Even though it wasn’t the time I envisioned where I would think only about my baby and tune out the rest of the world, even though I did the typical dilovely thing (sigh) and got involved in more activities instead… it was wonderful to wake up every day with E, to give him as many kisses as I wanted, whenever I wanted… to give him all of his sustenance for his first six months, to have the time to home-make his first solids, to do some EC, to play and learn every day… and just, to know him so well. I don’t like to think too hard about the end of this and how quickly it went. That’s when I start to feel sad and a bit panicky. Instead, I’ll think about how lucky I am to have the best family ever, and basically everything I could ask for. Maybe I’ll go have a popsicle. Just for fun, here’s a little pic of E and his Great Grandma Sue, taken last Thursday. He always likes to get close to her, and seems to sense how special she is. Oh Diana I love your blog. Tomorrow will be bittersweet for you I think. It will be so hard to leave E in the morning but to see him at the end of your day will fill your heart with such joy. It is hard to believe that you could appreciate motherhood even more than you do, but when I went out to work I appreciated every moment with kids more than I ever imagined I might. I loved being with them so much already I could not believe there was more. Sending you BIG LOVE and support tomorrow as you enter a new phase of motherhood. you do what you have to do, and this is it, and i know you will do it well and find all the positive parts and find a way to deal with the negatives, because that’s you. what a great beginning Everett has had! you’re all pushing off on this new phase from a position of great strength. good for you! 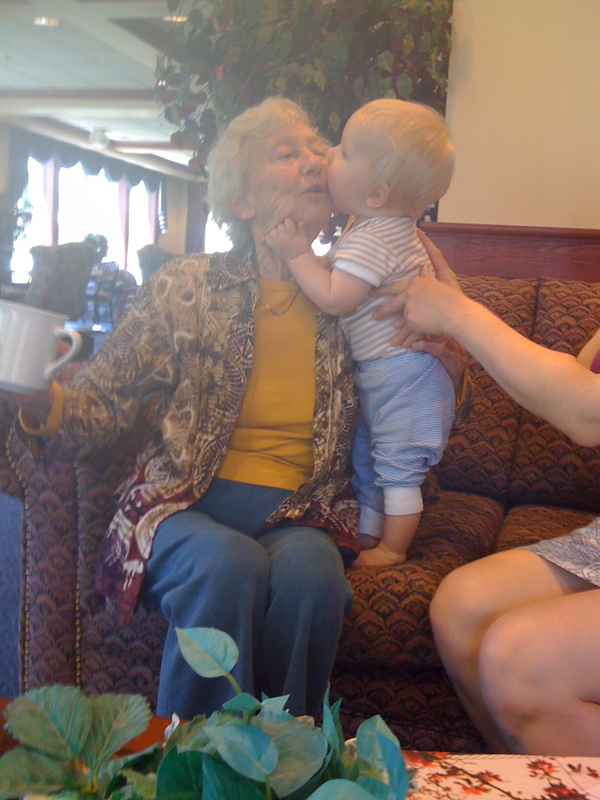 kiss dat baby for me — i love the picture with great-gramma Sue!